New book, 64 pages, ELI014. The British Army currently enjoys, both at home and abroad, the reputation of being one of the best in the world. Composed entirely of volunteers, its morale sustained by its curious and little-understood attitudes towards tradition, the British Army attracts respect and admiration from the military expert and the layman alike. 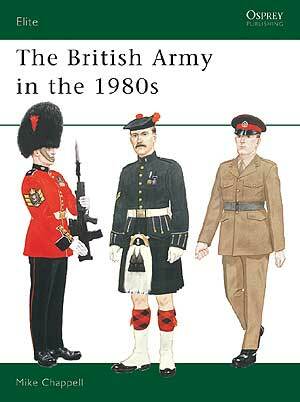 Written and illustrated by a former British Army infantryman with 22 years' experience, this book details the Army's history, organization, uniforms and distinctions. The text is backed by numerous illustrations and photographs. Contents: Defining a Military Elite - The British Army Today - Anatomy of an Army - The Corps and Regiments of the British Army - Uniforms and Distinctions - The Plates. This item was added to our catalog on Thursday 31 July, 2008.